It occurred to me last weekend that I don't have a proper oatmeal raisin cookie listed here (is it oatmeal raisin or raisin oatmeal?). And it has been an exceptionally long time since I've made them. 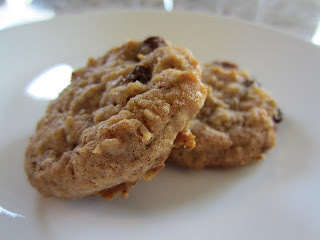 So under the guise of wanting to bring cookies into work, I went looking for a new recipe. However, I couldn't just bring an untested recipe into work. I have a reputation to uphold. So I made sure to test it out on my family first. What originally drew me to this recipe was its "grandma" roots and what made it even better was that it used shortening. This means that whenever I want to bake it, it won't require a lot of forethought (perfect for me). Granted I still made some changes. One thing about old school recipes is that they tend to load up on the sugar (in my opinion), so the first thing I did was reduced it. And because I had my heart set on oatmeal raisin I omitted the nuts entirely, upped the raisins and then increased the oats. And with such a cinnamon heavy recipe I thought a little nutmeg would be a nice touch (as always). I was hoping for a crispier oatmeal cookie, and when they first came out of the oven this was exactly what I got, but it faded later that evening. They still had a slightly crisp exterior but were much softer in the middle. But that's a minor gripe, because the cookies tasted really good. Perhaps they were a little on the sweet side but this was balanced by the flavour of the oats and the tiny hint of salt in each bite. 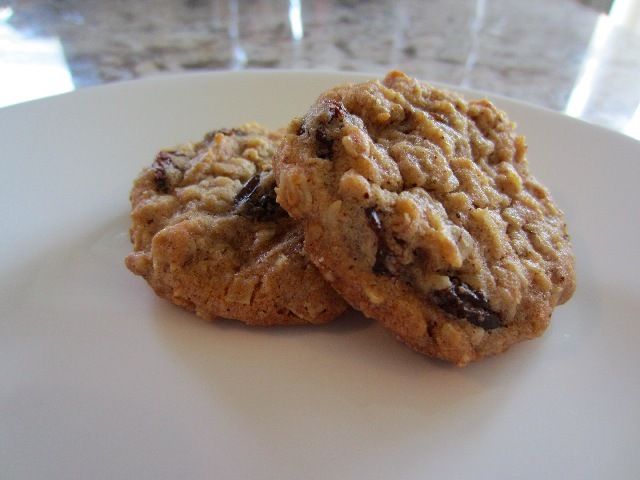 The cookies also weren't too "oaty" as some tend to be and the spicing was perfect; not at all overpowering. I was also really happy about my decision to increase the amount of raisins. Each cookie had just the right amount. These cookies were work bound. It was painfully hot on Wednesday and probably not the best day for baking. Every time I opened the oven it was like a Mario-style fireball being flung in my face (I am now much more sympathetic to goombas). I tell you this only as an excuse to explain why I forgot to add the salt to the recipe. Not that it seemed to matter. All my coworkers really enjoyed the cookies, a little more than I thought they would too (though maybe they're just not picky :)). More than a few times someone would stop by my desk grab a handful of cookies and happily walked away. On my brothers suggestion I had made both raisin and chocolate chip versions. 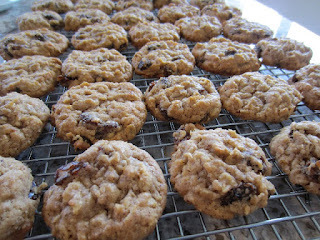 I, myself, prefer raisin as I find chocolate to be a tad overpowering in oatmeal cookies. I was happy to find that many at my coworkers agreed. Interestingly enough the cookies I brought into work retained more of their crispy-crunchiness even after storing overnight. This leads me to believe that the ones I made on Saturday hadn't completely cooled before I packed them. But no matter what version you end up with, you'll be happy with the results. These cookies probably won't blow your mind, but they're really good cookie, a classic. Everyone needs recipes that are durable, adaptable, and can be made in a pinch. And this is definitely one of those. In a medium bowl sift together flour, cinnamon, nutmeg, baking soda and salt. In the bowl of a mixer add shortening and both sugars and mix until fluffy. Beat in egg and vanilla until completely incorporated. Reduce mixer speed to low and slowly add flour mixture until completely incorporated. Add oats, and mix until completely incorporated. With the mixer still on low, add raisins/chocolate chips and mix until evenly distributed. or until edges of the cookies have browned (11 minutes was my favourite time).